An enticing and whimsical take on traditional hair pins. 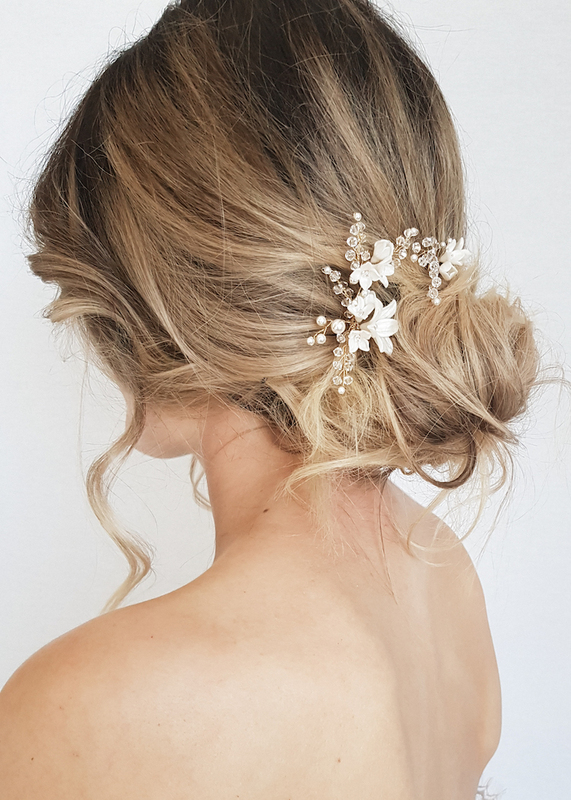 The set of 3 Briar-Rose bridal hair pins are small and dainty, with their exquisite details offering the perfect just picked from the garden look. These classic and pretty pieces are a sweet serendipity of shimmering pearls, clear crystals and life-like flower buds. You’ll be proud to wear them again after the wedding day to anniversaries and dinners with your beloved. *LIMITED QUANTITIES – Due to the popularity of the Briar-Rose hair pins, we have limited materials available to create this design. 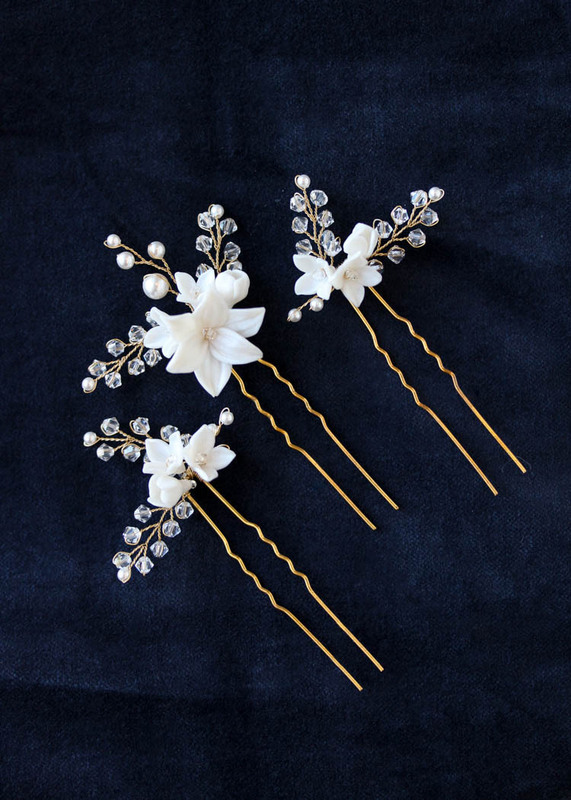 If you love these hair pins, we recommend you secure it before we are no longer able to recreate it. Set of 3 hair pins. Attached to 3 metal hair pins. The Briar-Rose bridal hair pins are ready to ship. Please allow 5-7 business days for your order to be processed plus delivery times. The Briar-Rose hair pins offers flexibility with styling through its simplified beauty. Style these pins alongside a messy bridal updo or scatter them along half up hairstyles for a more relaxed look. 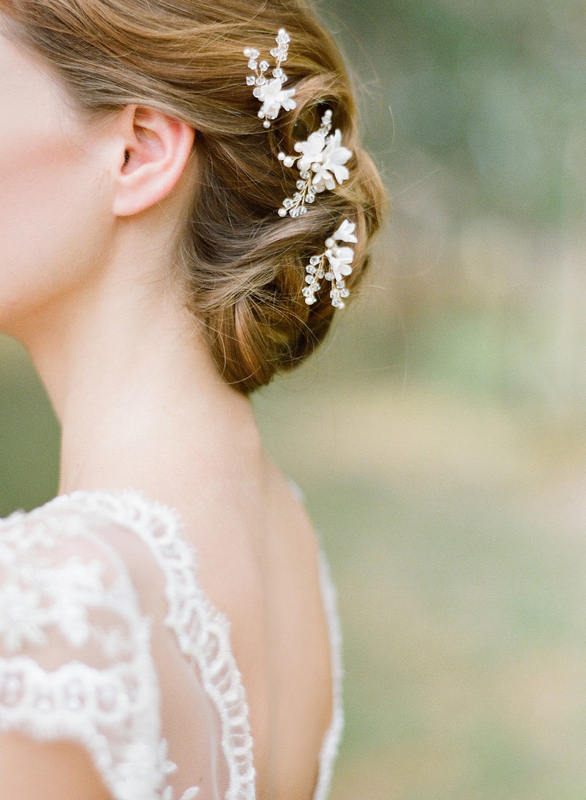 While there are no rules with styling these pins, a hairstyle with romantic appeal is a must! We love the Briar-Rose positioned to the side of the Blair fingertip veil, the Rosella, Audrey or Dahlia chapel length veils. For added detail, style Briar-Rose to the side of the Theodore or Nadia embellished wedding veils. Browse our full veil collection or contact us and we’d be happy to offer a recommendation to suit the Briar-Rose based on your wedding dress and hairstyle. The hairpieces can be reworked into smaller or larger styles to better suit your bridal hairstyle. Details can be reworked into a new design – for example, a larger comb, hair vine or a halo.